Immediate roof of a longwall panel is composed of layered coal, shaly coal, shale and clay strata overlaying by a thick sandstone main roof. The average depth of the coal seam is about 420 m and it has dip of 10°. The gate roads of width 5.2 m and height 3.5 m are developed in either sides of the panel and the roof is supported by 2.4 m resin grouted rock bolts. A special resin grouted 60 tonne capacity, 6.1 m long bulb type cable bolt is also installed for effectively supporting 8 m width shield installation roadway and gate roads during retreat of the longwall panel. 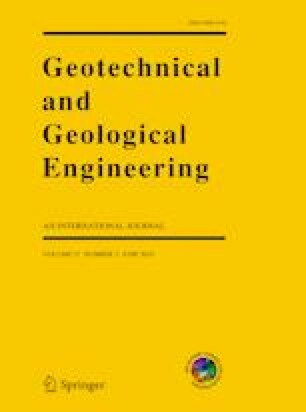 The paper emphasizes on the monitoring and analysis of roof convergence in gate roads by convergence recorder as well as double telescopic telltale devices. Based on the analysis results, design is modified to improve the stability of gate roads. Cumulative roof convergence (CRC) data during development of gate roads are found to vary as tangent hyperbolic function with passage of time and are analyzed using artificial neural network to estimate the key parameters of the function. Convergence increase rate along with the maximum CRC is then used to prepare a Trigger Action Response Plan for immediate notification of the ground control problems. Data analysis also suggests that during retreat of longwall panel, CRC increases exponentially if the longwall face approaches within 10 to 25 m from a measuring station installed along main and tail gate roads. In this paper, methodologies are described for the analysis of CRC data for better understanding of roof behavior and for taking timely decision for any unusual event. The authors wish to express their sincere appreciation and grateful thanks to the management of SCCL for their support and cooperation, for permitting to present this paper and also permitting to use certain data for presenting in this paper.